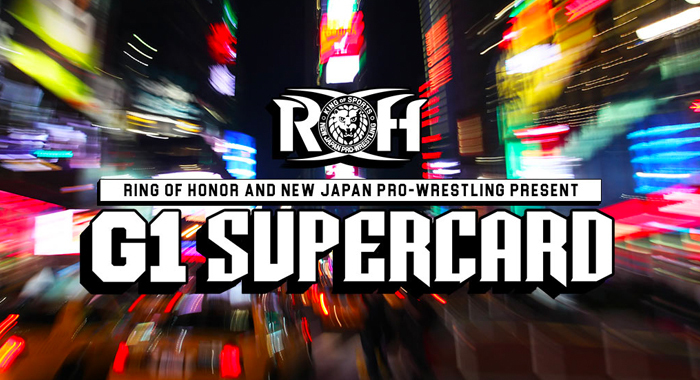 G1 SUPERCARD: NEW YORK LIVE NOW- ROH & NJPW JOIN FORCES! Kenny King is number one, per request, but number 2……Minoru Suzuki! The two face each other down and King starts to hit some chops but Suzuki just laughs them off. He hits King down before the next entrant, Cheeseburger makes his way to the ring. Cheeseburger gets a big strike from Suzuki right away. Next up is the Beer City Bruiser. Next up is Sho Tanaka and then comes out Shingo Takagi. Takagi goes right after Sho and the two are going it before Bushi comes out and he and Takagiwork together to take down Sho. They hit a senton/legdrop combo. Shaheem Ali is next but as he comes out, the Beer CIty Bruiser. People are coming out fast and furious now, including Ryusuke Taguchi There are about 10 guys in the ring now and it is utter chaos. Will Ferrara comes in at number 13. Up next is Chase Owens who comes into the ring and goes right after Minoru Suzuki. He counters a hip attack with an atomic drop. Up next is Rocky Romero, and he puts Bushi in the corner and we get a train of multiple stars splashing Bushi. Out comes Brian Milonas who takes out two stars. Next up is Bad Luck who immediately takes out Sho. He then grabs Cheeseburger and tosses him over the ropes but he’s caught and put back in the ring! The next entrant is Jonathan Gresham and Fale and and Milonas are face to face but interrupted. In next is Tracy Williams. A few more guys come out but finally….ITS JUSHIN THUNDER LIGER!! Liger comes in and eliminates Milonas! The action is fast and furious to call and the guys keep coming in faster and faster. Delirious comes in at #25. He doesnt get in the ring for a while, but the action stops when Tomohiro Ishii’s music plays. He gets in the face of everyone right away. He takes out and eliminates PJ Black. Up next is Toru Yano. Yano goes off the stage and goes to the announce table. He gives Colt Cabana his elbow pad and gives him his spot! Colt does his elbows schtick and takes out a few people. The crowd is chanting for Colt! In the meantime, it looks like EVERYONE wants to take out Bad Luck Fale! We have about 10 guys who eventually do the deed. We then hear the Bullet Club music….but who is it?? ITS KING HAKU!!! Haku grabs the neck of Cabana, and we get our next entrant…THE GREAT MUTA?! WHAT IS HAPPENING?! Muta comes in and eliminates Delirious. Suzuki eliminates Yano and Colt Cabana. Muta eliminates Jonathan Gresham. Cheeseburger is eliminated. Lots of eliminations take place at the same time and we are left with the final 4! Muta, Liger, & The Kingdom! The Kingdom are eliminated fairly quickly and left over…GREAT MUTA AND JUSHIN THUNDER LIGER! Muta hits Liger with a dragon screw then an elbow! He stalks Liger but out of nowhere, we have Kenny King who comes in and eliminates Muta and then Liger! The winner is Kenny King! This is a winner take all match! Cobb splashes Osprey quickly and Osprey tries to answer back, but Cobb shoves Osprey across the ring. The match comes to the outside quickly, and Osprey jumps off the barricade and hits Cobb hard. Osprey gets back in the ring and hits a handspring moonsault over the ropes but Cobb catches him! Cobb goes for a slam, but Osprey turns it into a DDT! The match goes back in the ring and makes it to the top rope and Cobb hits Osprey with an enormous superplex. Cobb picks up Osprey and hits him with a HUGE fallaway slam and then a standing moonsault. Osprey gets up and the two start to trade shots back and forth. Cobb winds up and Osprey uses the motion to turn it into a Spanish Fly! Cobb comes back with a power move and slams Osprey, climbs up top and whiffs on a frog splash. Osprey uses that to connect with a Robinson special, then calls for the Oscutter! He tries for it, but Cobb catches him and he tosses Osprey to the corner. Osprey lands on the second rope and bounces off to hit the Oscutter! He goes for the cover, but Cobb kicks out at 2! Cobb staggers to his feet and gets a heel kick. Osprey tries for a move but Cobb gets to the ropes. Osprey kicks Cobb down and tries to hit a top rope move, but Cobb is able to counter with a top rope Tour of the Islands! Cobb is fired up and hits Osprey with a second Tour of the Islands to pick up the victory.